Important! 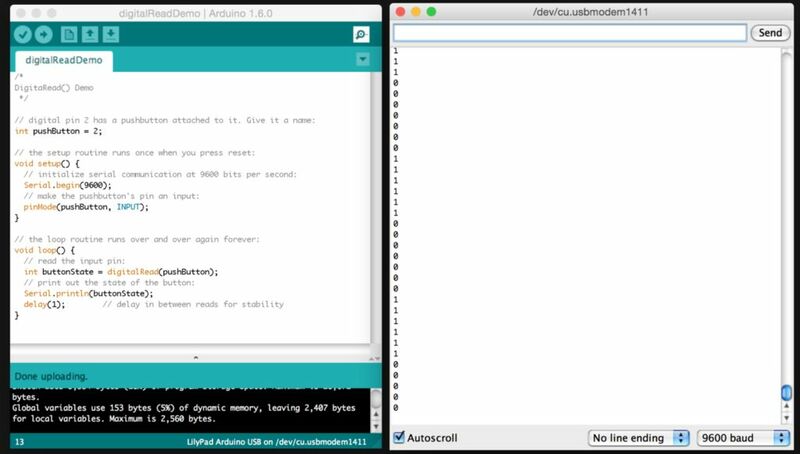 Before the workshop, please download and install the Arduino IDE and add support for Adafruit boards. 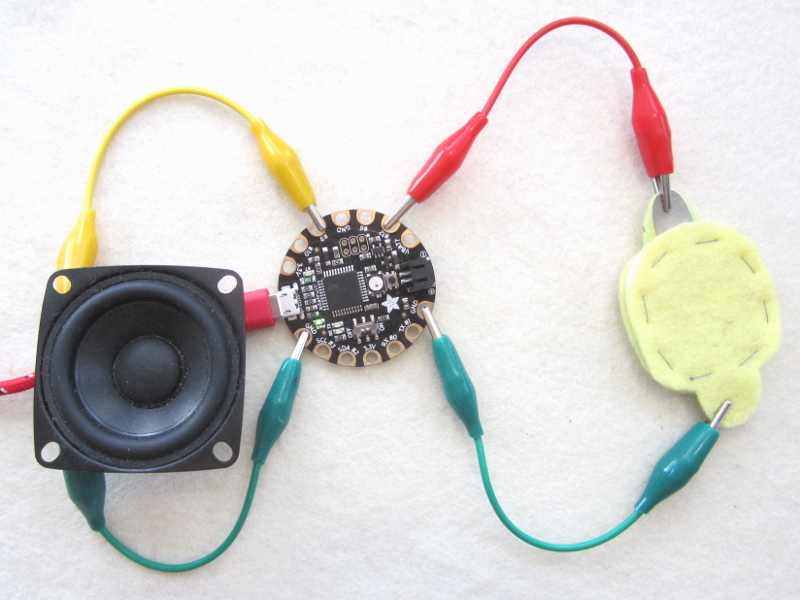 Follow Adafruit’s excellent tutorial on how to do both of these things. – What do the terms “wearables”, “wearable tech”, “wearable electronics”, “soft circuitry”, “e-textile” mean? – What are common topics and themes explored by this field? 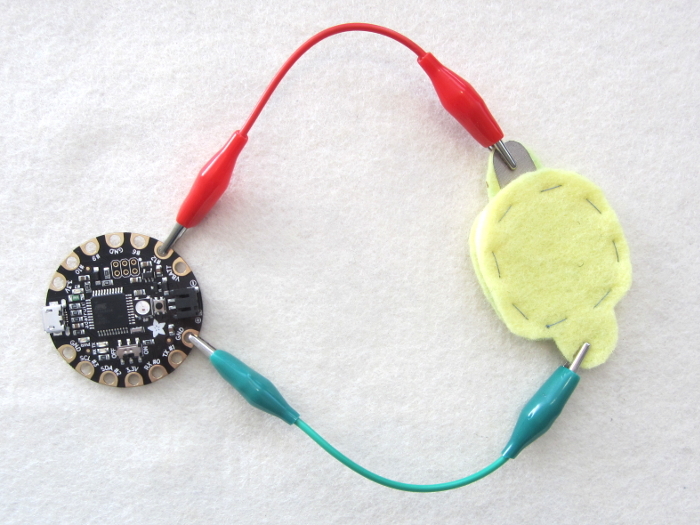 Soft circuitry is often found in wearable electronic projects. 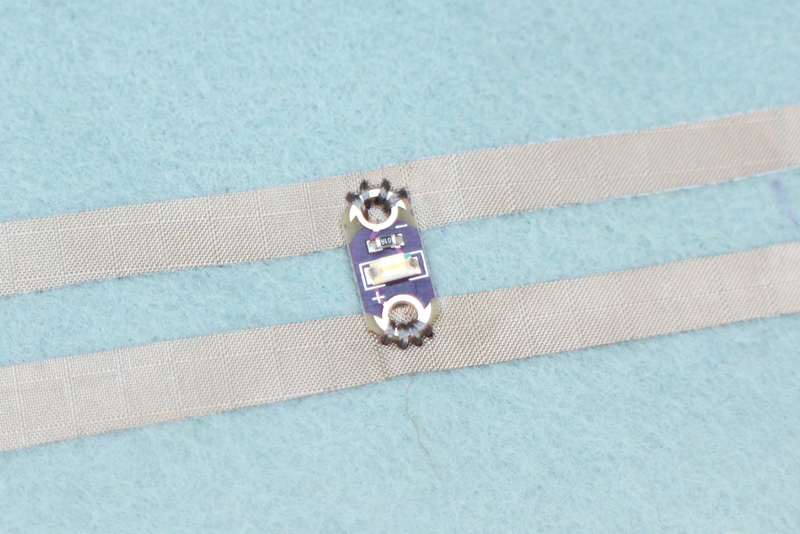 Learn about conductive threads and fabrics and how to use them to build soft, flexible, and wearable electronic projects. Onboard power regulator protection diodes and polarized connectors make it difficult to fry a Flora by accidentally connecting too much power. Onboard RGB LED for quick start and debugging. – Review of components our circuit will use: switches, flex sensor, LEDs, speaker, power, conductors. When building your switch you can start to think of what you would want your switch to activate. Do you want your switch to be on a t-shirt? 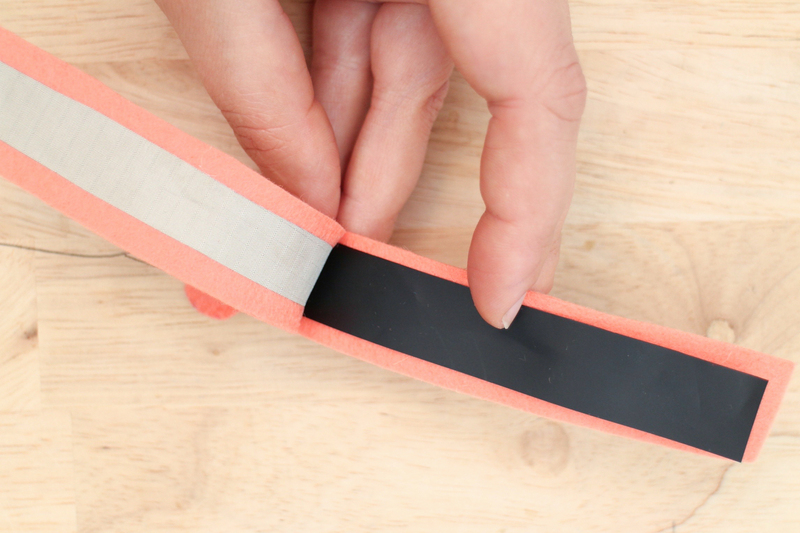 Do you want it to strap to the bottom of your foot or around your hand? 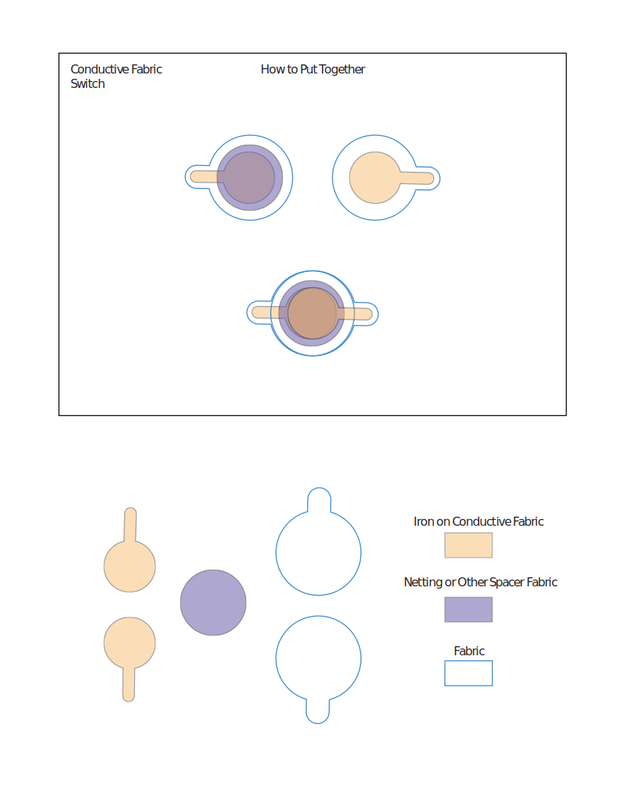 You can create the switch for an action or make a momentary soft switch using the provided printed pattern. 1) Choose what board you are using. 2) Choose what port to communicate through. Upload the sketch by hitting the upload button. There is not an LED in this circuit that can tell whether or not the switch is doing what it’s supposed to; all the action is happening on board. So, how do you know your switch is open and closing? You can read the results in the serial monitor! When opened, there should be a string of 0s and 1s printing. Press the switch and see if anything happens. If a 0 isn’t already there, one will pop up. Do you notice anything about the behavior of the switch and the prints in the monitor? It’s hard to actually see a relationship between your press and when it prints a 0 or 1. Your goal is to get a clear 0 or 1 printing in the window when the switch is open and the opposite printing when it is closed. Why isn’t this happening? This is happening because what you have now is a floating pin. When the switch is closed the switch lead connected to ground is referenced which is why you get a 0. When the switch is open, the pin doesn’t know what to reference because it’s not connected to ground or power. So, how do we give it a reference? Grab a 10K Ohm resistor and connect it to the switch and board as shown. 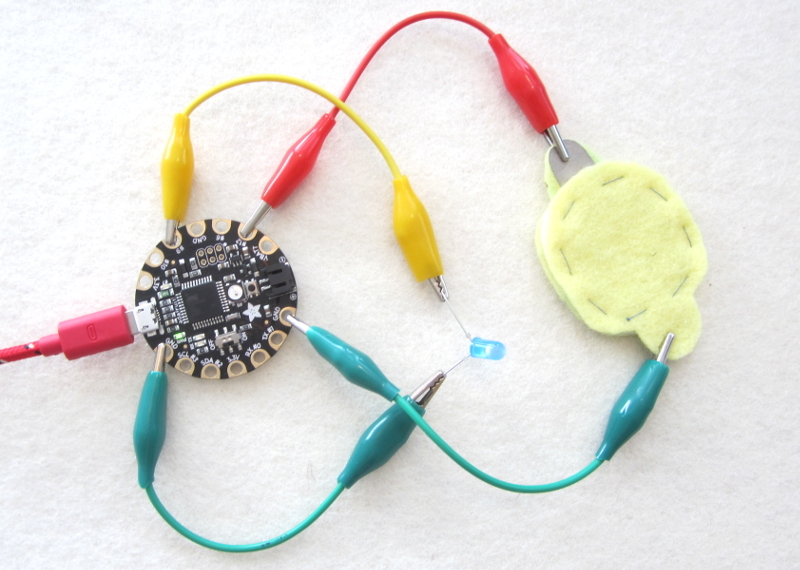 The Flora microcontroller and most Arduino boards already have resistors connected to some pins. These are called the board’s internal pull-up resistors. They are called pull-up instead of pull-down because instead of them being connected to ground (0V), they are connected to power (3.3V) pulling it up to a positive voltage value. Using them really helps to minimize the amount of hardware you need to deal with. 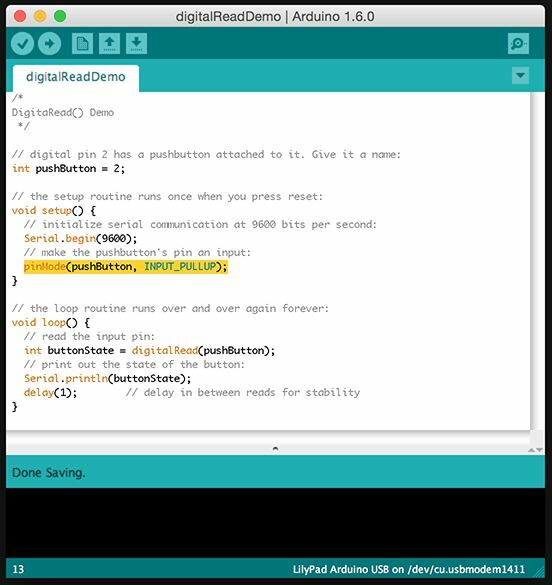 Instead of adding an external resistor to the circuit, the internal pull-ups are enabled through software in the Arduino sketch. 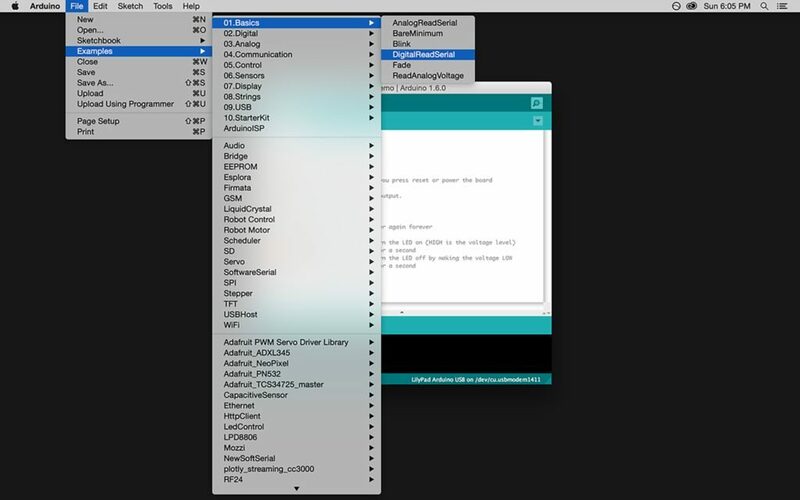 Open up your serial monitor again and check the output. Actuate an LED with your switch. Upload sketch. The LED will be on when the switch is open and off when the switch is closed. What do you change to make the LED start off and come on when the switch is closed instead? Connect a speaker to the Flora. 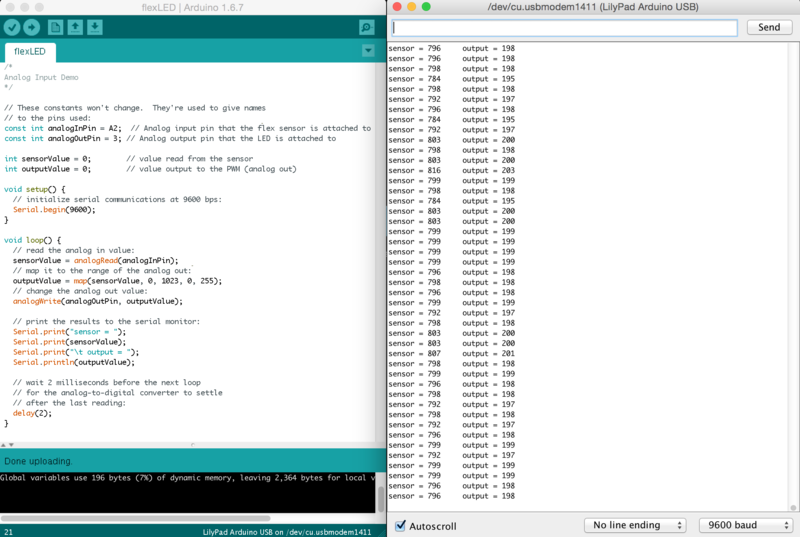 Open a new sketch in the Arduino IDE. Double check your pin numbers and upload. A note will play when you close the switch. How do you change note being played? 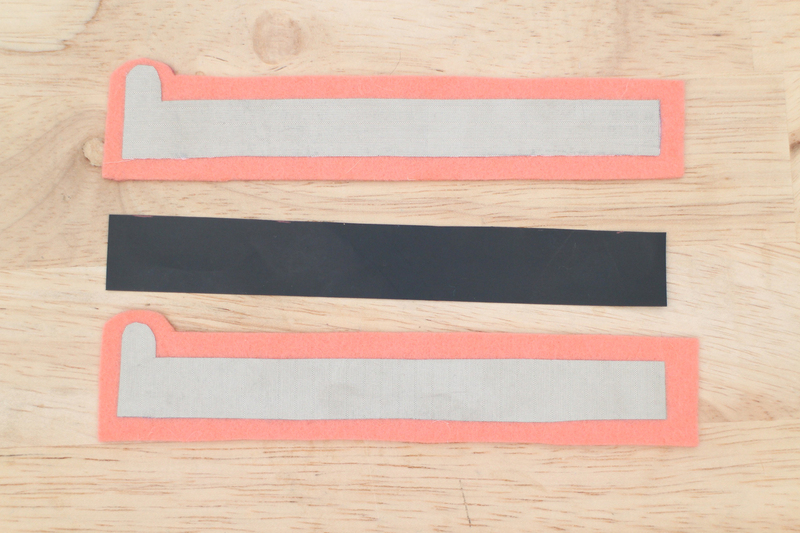 The materials you are going to use to make your sensor are conductive fabric and a resistive plastic called Velostat. Velostat changes resistance when force is applied, so it works as a flex sensor but it also works like a force sensing resistor (FSR) which is another resistive sensor. What’s cool about a handmade sensor is that you can cut it into any shape you like. They also tend to be a bit more sensitive depending on how it’s made. 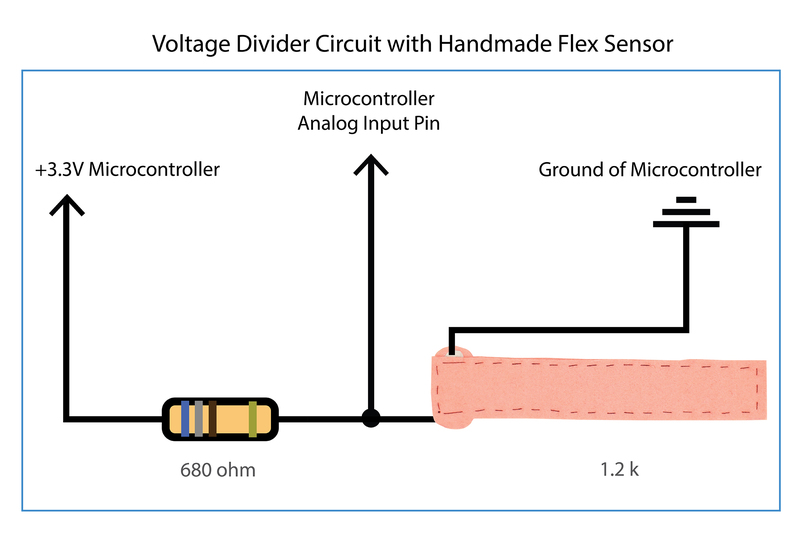 Let’s make a flex sensor! You will use conductive fabric to read the changing resistance while electricity is flowing through the plastic. 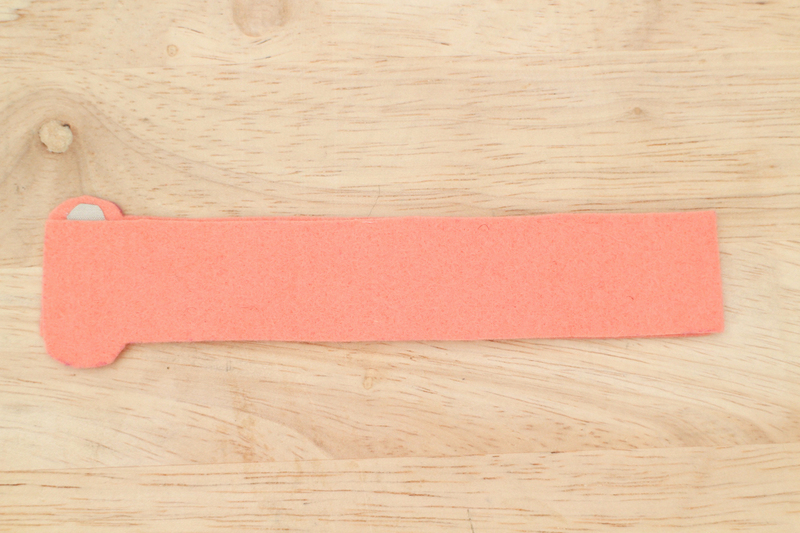 These are similar to the contact design you cut and used for the Hi-5 Collector’s soft switch. Here is the important part – make sure the conductive fabric contacts are small enough to be completely covered by the Velostat. If the contacts touch it will create a short and the electricity will not go through the resistive plastic. You will end up with a soft switch instead of a resistive sensor! 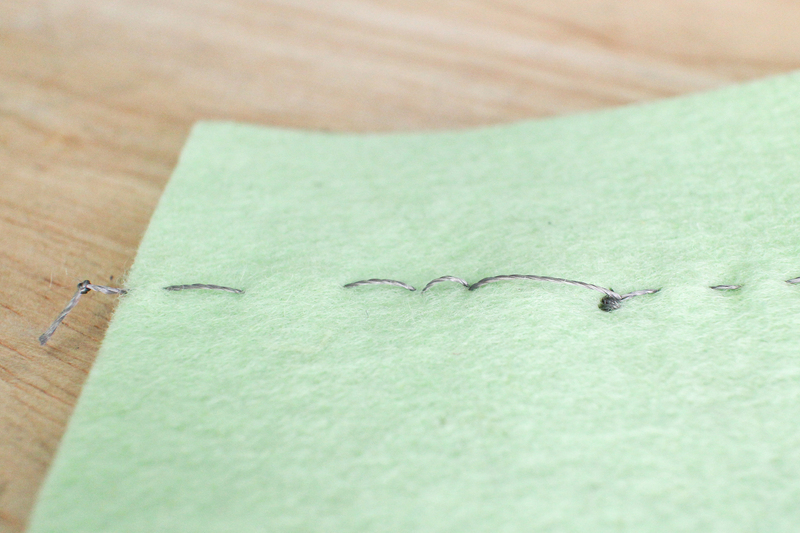 Place a conductive contact and the resistive rectangle on top of a piece of felt. 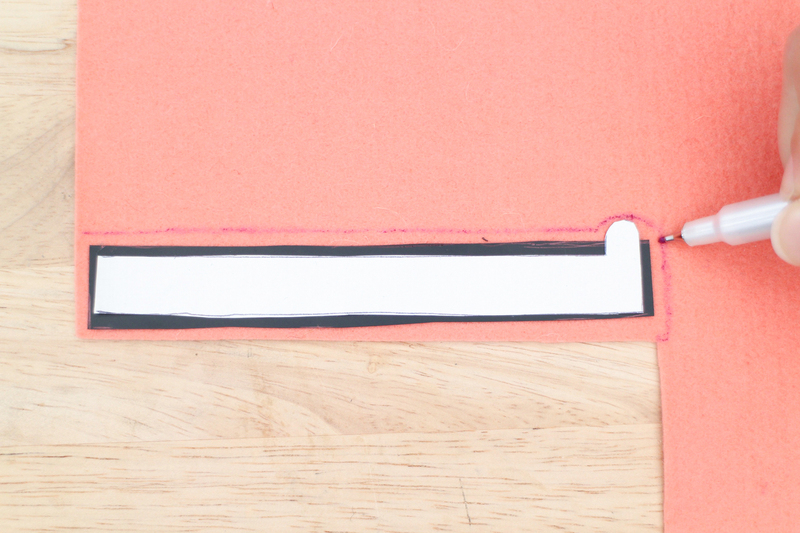 With your fabric marker draw around the edges leaving a border of at least 1/8″. Thread a needle with about 18″ of regular thread. 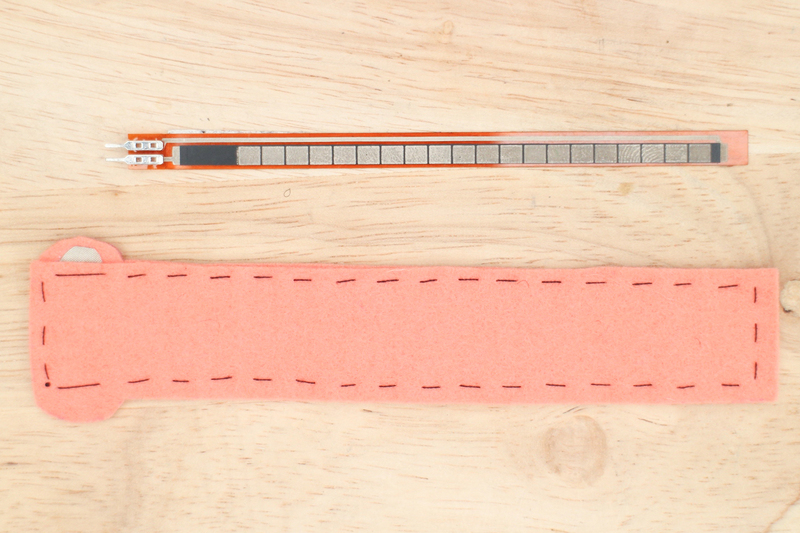 Use a running stitch to sew all around the edge of the sensor. Get close to the edge of the Velostat inside but try to avoid piercing through it with your needle. 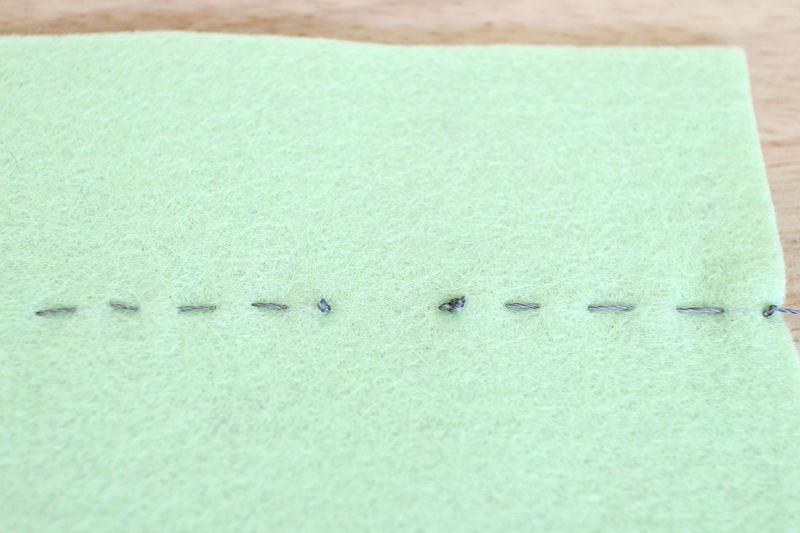 Skip over each conductive fabric lead with the thread rather than sew through it. Your sensor is done! Time to test it. 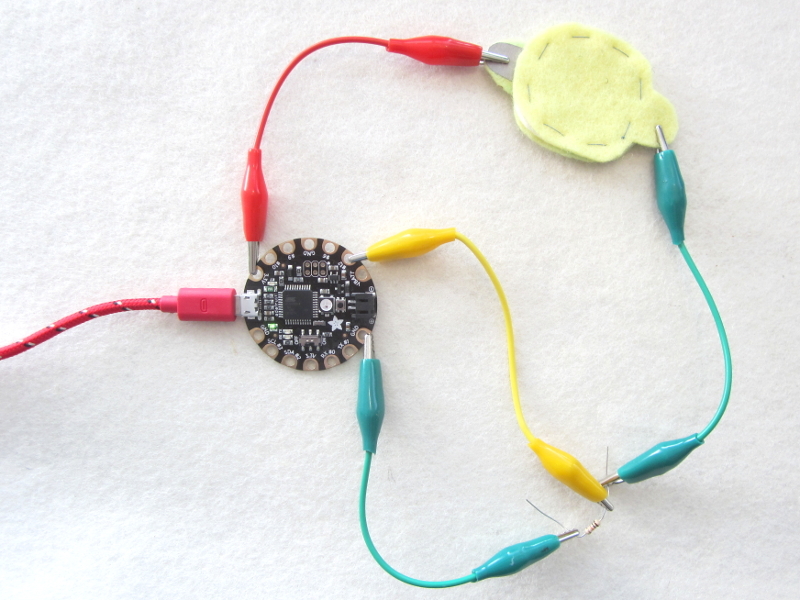 Connect your handmade sensor to the multimeter. Flip the dial until you get a reading. If you used the provided pattern the resistance of the sensor while it’s lying still will be around 1.5k ohms. Press and bend the sensor and watch the resistance go down! The circuit we are building is the latter with one fixed (like the one you used for the sewn circuit) and one variable resistor you would like to read (the flex sensor!). You run electricity through the two resistors and take a reading from the point where the two resistors meet. When the sensor changes resistance the voltage coming from the middle point, labeled “Voltage Out” in the diagram, changes. Below is the voltage divider circuit using schematic symbols. In this diagram R1 is the fixed resistor and R2 is your sensor (variable resistor). 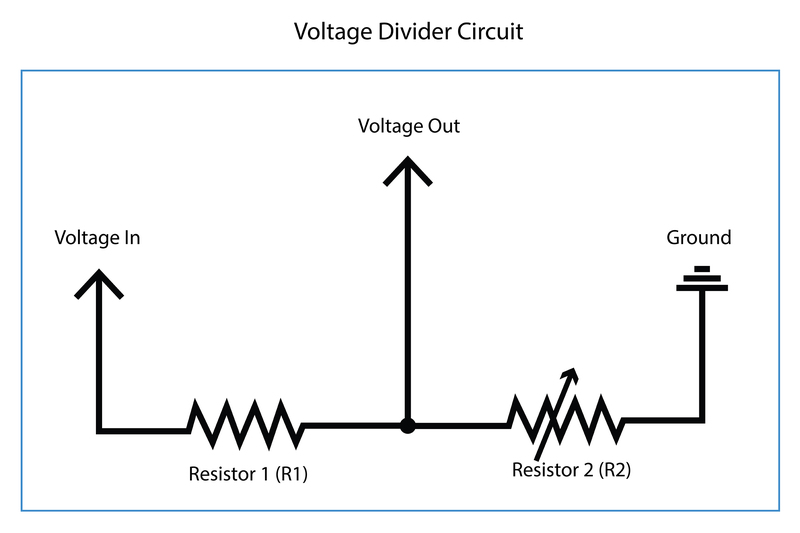 The value of the fixed resistor (R1) in the circuit is important because it will determine the range of voltage coming out from the “Voltage Out” point. There are many values of resistors to choose from. R2 represents our sensor in the above diagram. How do we know what value resistor R1 should be? The value of R1 will determine the range of voltage that gets read by the microcontroller, so you shouldn’t choose just any value. To get the value that is best for your sensor there is a general rule of thumb to go by. This rule is easy to remember and will ensure you get a nice large range of voltage to work with. Want to know the math behind this circuit and how it works? 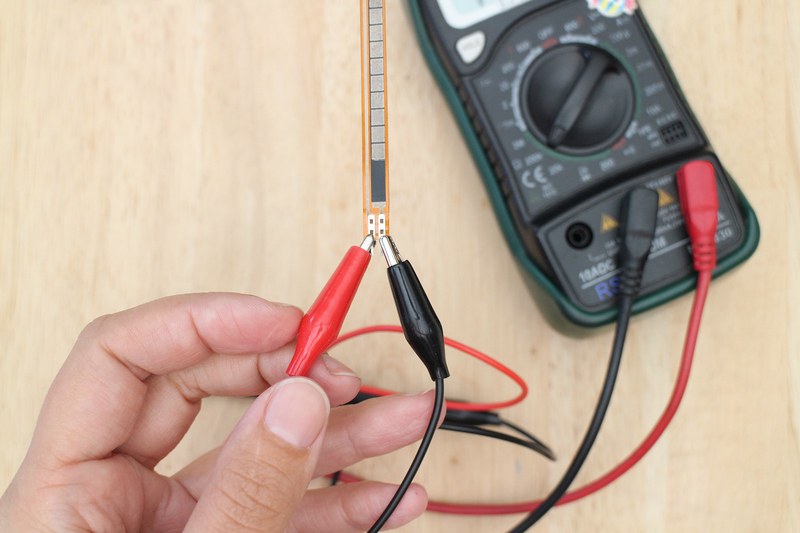 I won’t get into it here instead, head over to Sparkfun’s Voltage Dividers page to learn more and make sure to check out their nifty voltage divider calculator. Ok, so now we have our fixed resistor value which is R1 in the diagram and we have our sensor which is R2. What about the rest of the diagram? 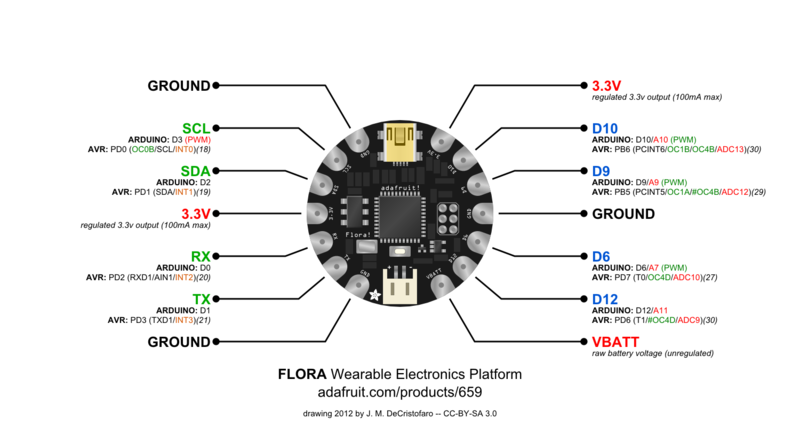 What gets connected to what on the Flora microcontroller? Below you can see how the above diagram is applied using your two resistors and the microcontroller. The “Ground” translates to the ground on your Flora, the “Voltage In” is the 3.3V coming from the power (+) pin on the Flora and the “Voltage Out” gets connected to an analog input pin so the board can read it changing. The “Voltage In” gets divided so the “Voltage Out” will always be smaller than the “Voltage In”. Great job getting through this! Now, let’s get hands-on and see how this works. Connect the sensor to the Flora. Upload sketch and bend the sensor to change the LED’s brightness. Open the serial monitor to see the sensor’s values. Take a look at the numbers next to “sensor =”. When the sensor is resting record the number you see here. The number will change constantly so record the one you see the most and round up to the nearest ten. Now, bend or press it to the maximum amount and round down that number to the nearest ten. Plug these numbers, into the map() function map them to the LEDs output values of 0 – 255. Upload the sketch again. The LED will now have a larger fade range because it is calibrated to your sensor. If your LED flickers it means that you should raise or lower your minimum and maximum. For example, if your sensor drops below the minimum you put in the sketch the board will give the LED full voltage and it will get very bright. You can also see this happen in the serial monitor, the values next to “output =” will become negative. If this happens lower the minimum in your sketch. Connect a speaker to the Flora and keep the sensor connected. Copy, paste and save sketch as flexPitch. Change your analog pin, your min and max values, and speaker pin. Next class, we will put this circuit on the body! Think of where you would want to place your sensor, switch and what output you would like to control: light or sound. 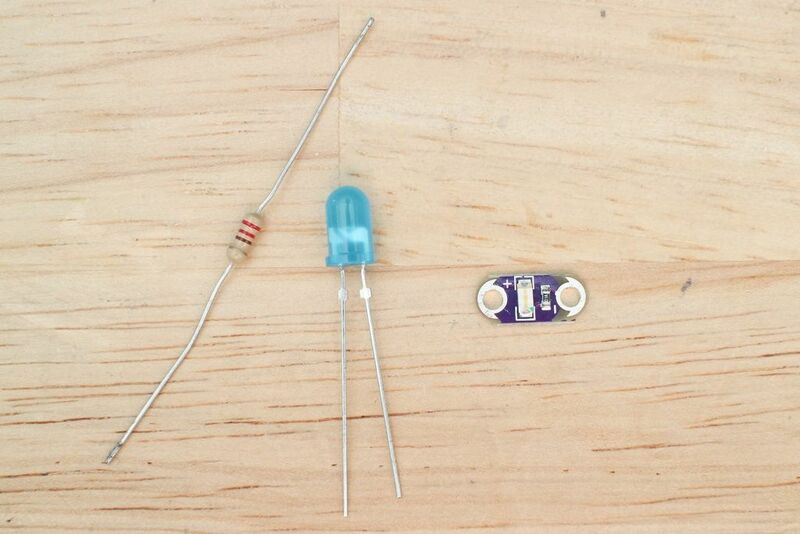 When conceptualizing your project, LEDs are a great placeholder for more complicated components and actions. It’s encouraged to imagine what the LED could represent. For example, turning on a motor, opening a door, beaming a signal to a satellite, anything! Get weird! If you would like to explore the potential of controlling another kind of output that is accessible in the lab, feel free to discuss with me in prep for the next class. Head over to a Reading Body Movements tutorial I wrote up to guide us. Break up into teams to help you with your brainstorming. 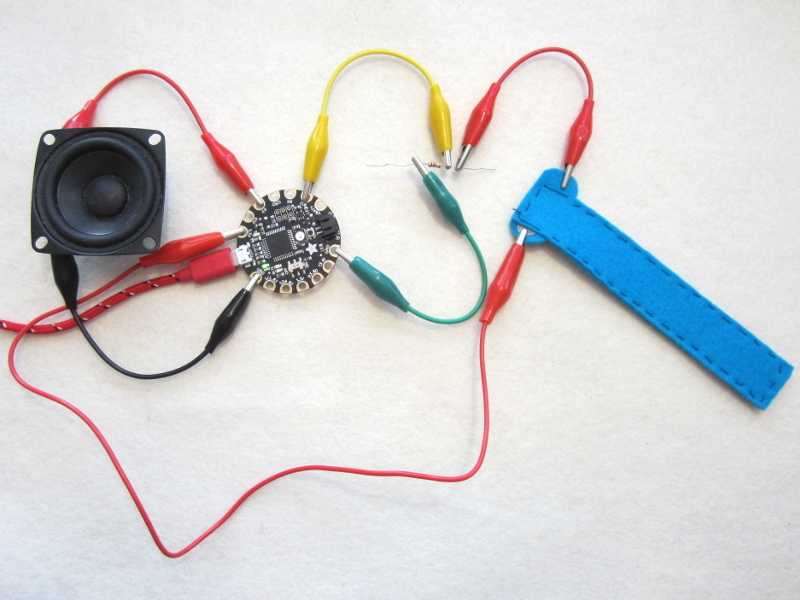 – Experiment with pins and velcro placing the switch and sensor on different parts of the body to activate them. – Record findings and decide where your circuit will live. 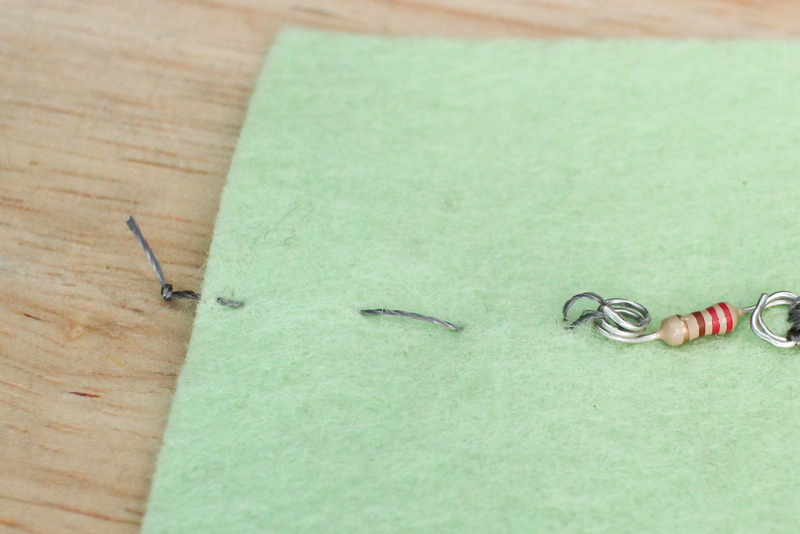 Head over to a Transfer Circuit to Fabric tutorial I wrote to guide us. Incorrect – A loose end of conductive thread is coming from the bottom (ground/-) and is touching the top (power/+). The current will not pass through the LED. 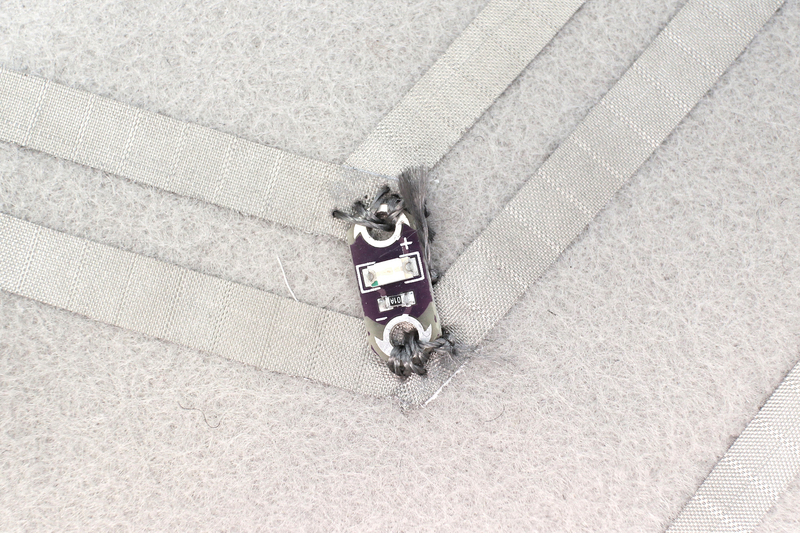 Instead, it will take the path of lower resistance through the conductive thread. Correct – This is an LED with no short circuit occurring between power (+) and ground (-). Incorrect – A short created by forgetting to end one trace and begin a new one. 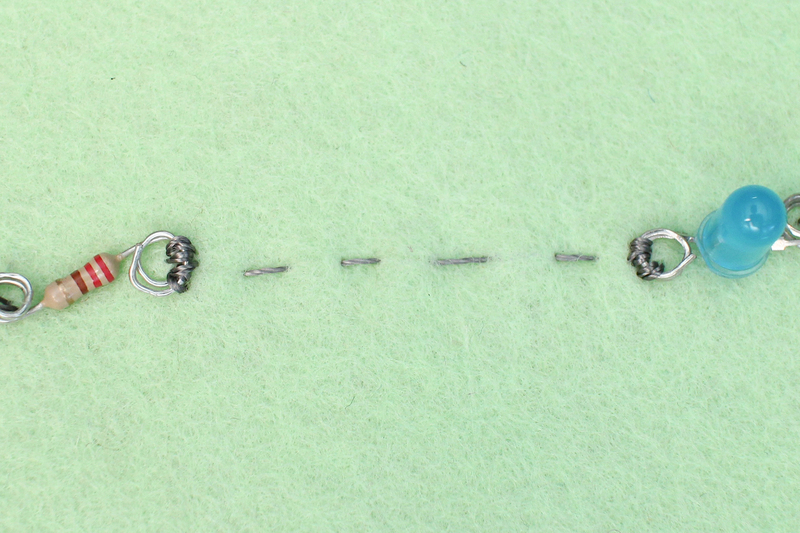 This continuing stitch line connects two sides of a component together. The current will not pass through the component. 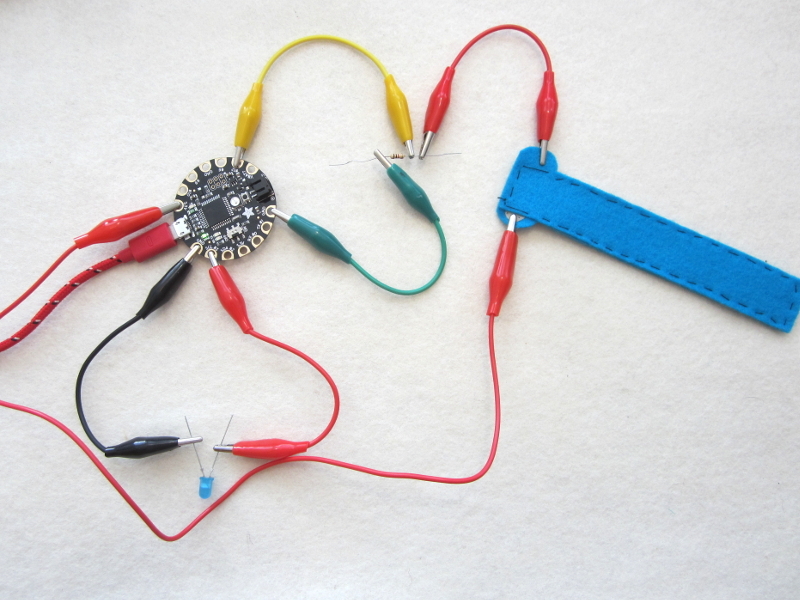 Instead, it will take the path of lower resistance through the conductive thread. Correct – One trace ends and another separate trace begins on the opposite side of a component. The current will then pass through the component instead of taking a shortcut on the path of lower resistance. Incorrect – Loopy and loose connection and trace stitches. This connection will sporadically break while the circuit is moved around. Correct – Tight and small stitches make good connections and a neat stitch line. 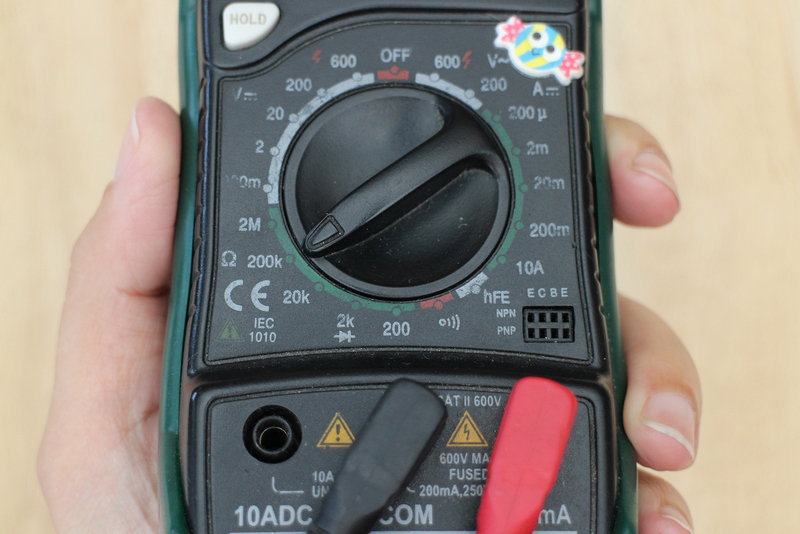 – Test connections with a multimeter as you go! – Record how would you improve the circuit. What would be the steps in this prototype?